Steeped in history of ancient cultures, intrepid explorers, pioneers and pirates... Ft. Myers and Ft. Myers Beach are way more than just beautiful places to enjoy the wonders of Southwest Florida. 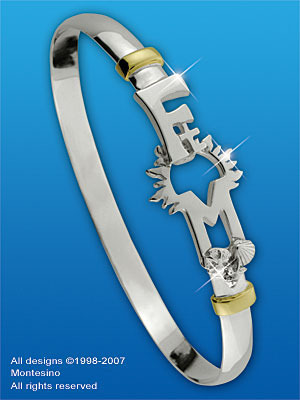 The Ft Myers Destination BraceletTM is a tribute in precious metals to town and the beach and also embodies all of the spirit of both. In simplistic design the Ft. Myers Destination BraceletTM suggests a gulf sunset touching the shimmering water, strolls along the beach and finding that perfect shell for your collection, or maybe that relaxed evening cruising down the river. Two 14 karat gold wraps represent Ft. Myers and Ft. Myers Beach basking in the golden Southwest Florida sun. The Ft. Myers Destination BraceletTM is a symbolic treasure that reminds of these special places... each time you glance at your wrist! Enjoy the sunset!